There will be no doubt that you are now married and will now be known as Mr. and Mrs. 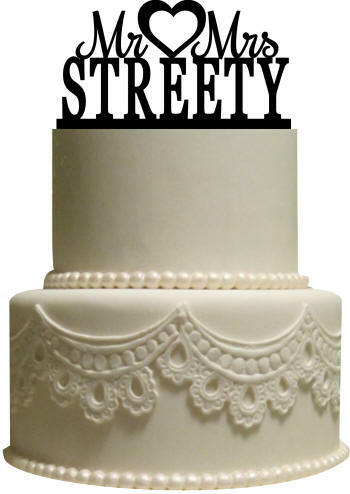 Celebrate your wedding with this fun personalized cake topper. Crafted from acrylic, we laser cut your last name, the wors Mr & Mrs. and an outline heart, to creat a custom wedding topper that is the perfect addition to your wedding cake. Useful afterwards as a wreath decoration or for display on a shelf, this cake topper will be enjoyed after your wedding nuptuals. Acrylic is 1/8 thick and has 2 in. extensions to anchor the topper into the cake.